Ever wonder what goes into a wedding photo shoot? 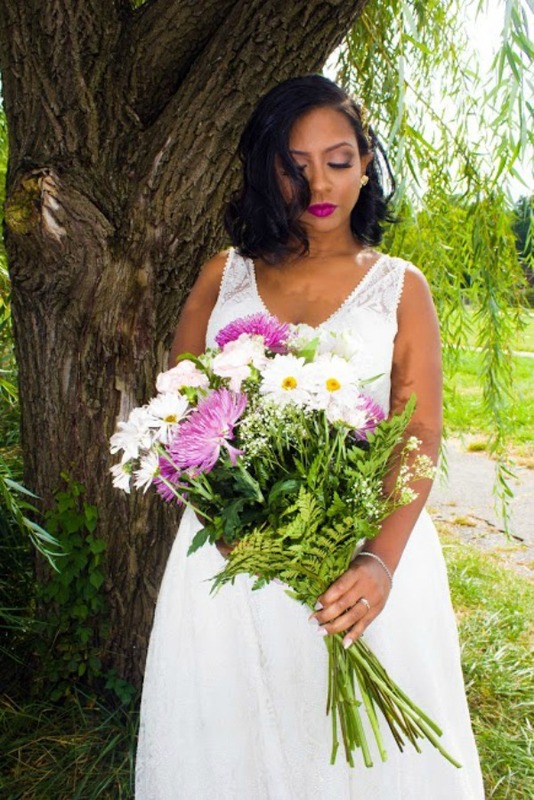 In today’s wedding spotlight, Shafon Bratcher-Michel of Jumping the Broom Weddings offers us a glimpse inside the details of planning and photography for this intimate wedding style shoot. Thanks Shafon! Location: Flushing Meadow- Corona Park- Queens, NY. Vison for the shoot: Funky, carefree, colorful and just pure love. 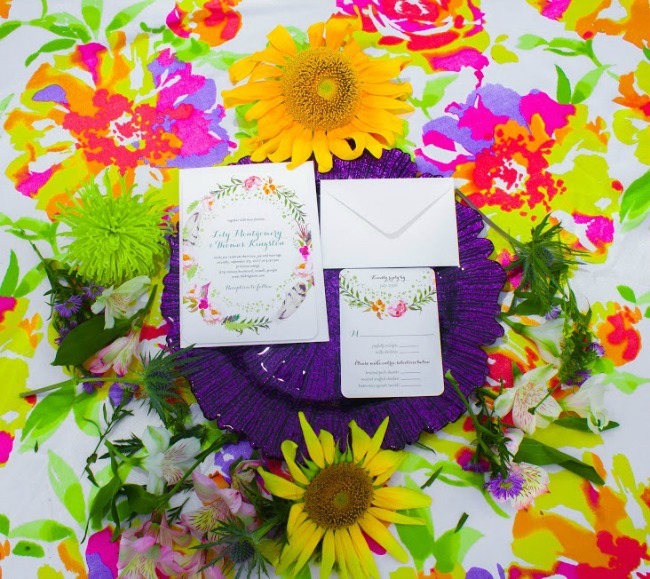 Printed linens are a huge trend in weddings right now! 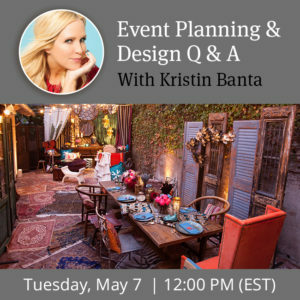 The name of the linen for this style shoot is Blumen Shantung from specialty rental vendor, BBJ Linen. 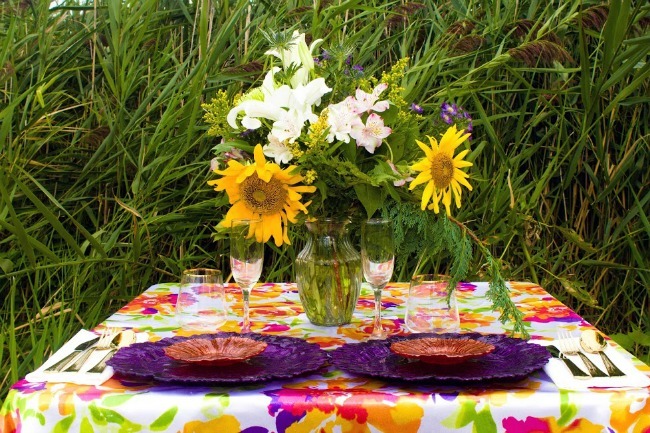 This gorgeous table linen is comprised of hot orange hues, purples, electric pinks and green floral. 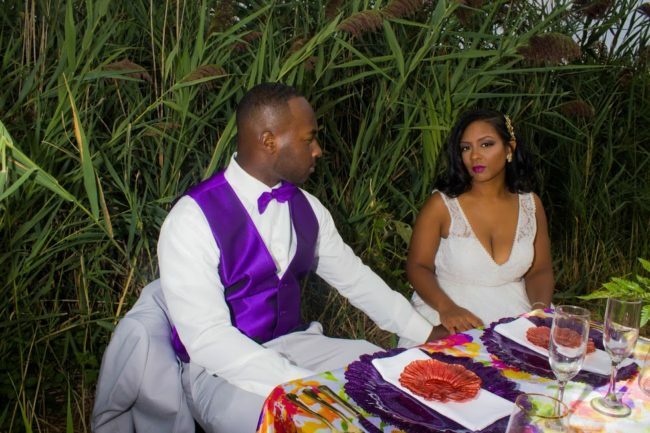 In addition, to compliment the funky colors purple and gold are used throughout the style shoot, as seen on the reception table and the couple. The invitation and RSVP card was donated by Wedding Paper Divas, an online stationery store that caters to all celebrations. I chose the Strung Floweret Wedding Invitation, I thought it complimented the overall theme. Unique elements included in this style shoot are definitely the Sea Sponge Chargers and the Sea Sponge Coral bread and butter plates, they are different and definitely gave a kick to the table. The Gilded Royale Stemless Wine Glass and Collier Flatware adds the perfect sparkle. My favorite moment for this shoot would have to be the couple, their love for each other is genuine so there was no need to say, “do this, do that” it is real and pure, no practice needed. My favorite hand crafted detail would have to be the cake table, I took apart some of the bouquet and I planted them around the cake, very simple and beautiful at the same time. The florals were donated by Bath Beach florist located in Brooklyn, NY, they were simple, and the Sunflower was definitely an eye catcher for the table centerpiece. 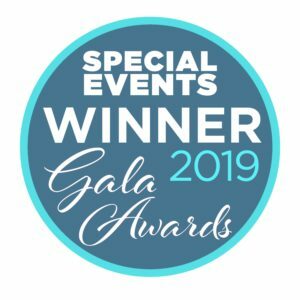 As for the bride’s bouquet in the world of wedding bouquet trends, loose, Organic, wide and bridal bouquet shapes are in, nothing contained just wild and free. 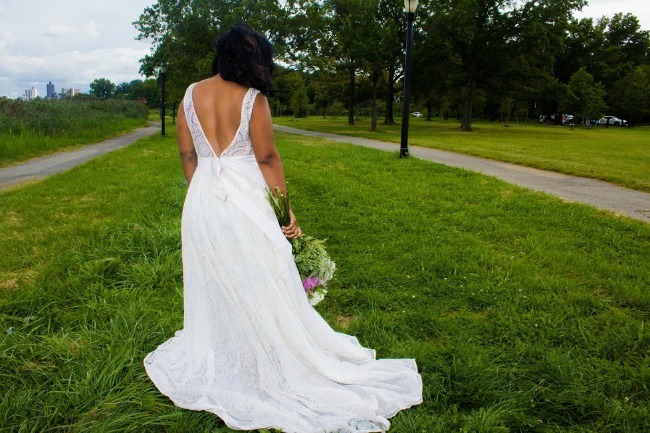 The gown was borrowed from Celia Grace Wedding Dresses which are Eco-Friendly and fair-trade located in Amherst, MA, the name of the gown is Teresa, and this dress is as beautiful as they come, an ivory lace dress with a deep V-neck and a flattering waist line. This year in the world of wedding dress trends this dress is definitely a winner! 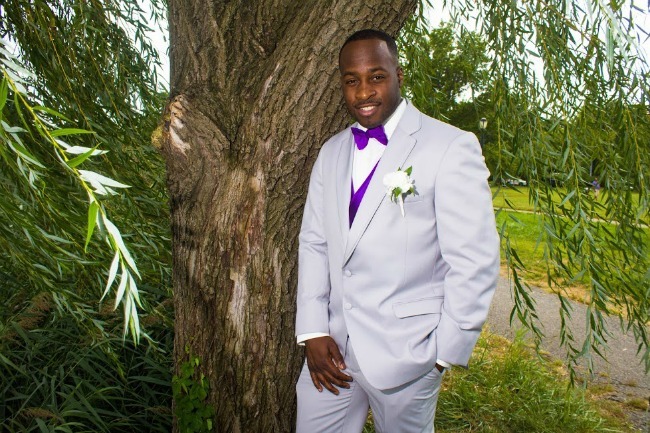 The tuxedo was donated from Xedo, an online tuxedo experience for the groom and his groomsmen located in Chicago, IL, the name brand of the tuxedo is Allure, the color is cement gray, a very light cool gray in a superfine wool blend ideally suited for daytime or outdoor events. 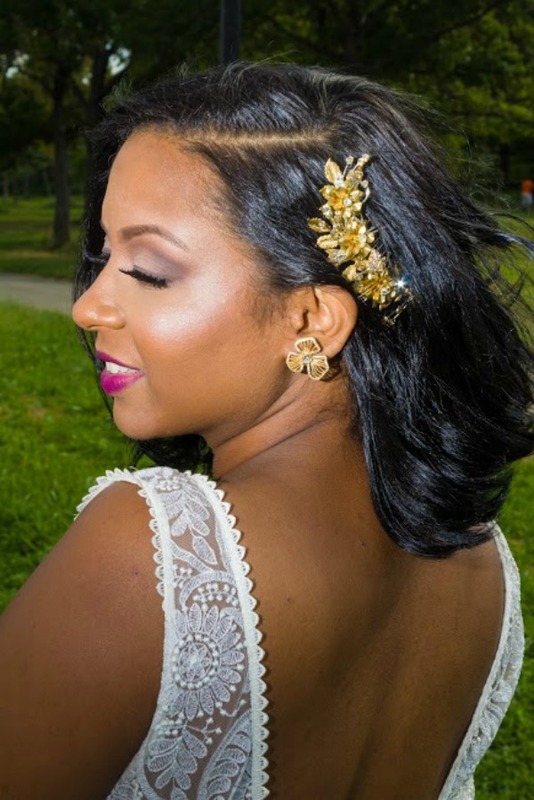 The bridal accessories were donated from Happily Ever Borrowed, a super friendly site to go on to rent high-end accessories for your big day located in Brooklyn, NY, from designers like Justine M Couture, Enchanted Atelier and many more. Items used in the style shoot were the Daphne Wreath, Dogwood Crystal Stud Earrings and the bubble veil. The cake was donated from Cakes Unscripted located in Brooklyn, NY, cakes are usually made on the weekends for weddings, and other celebrations. 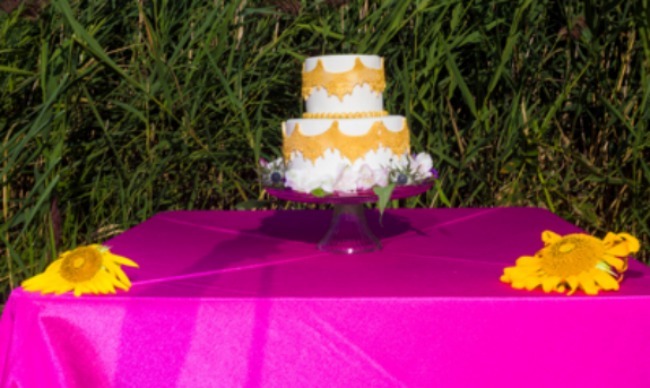 This cake used in the shoot was covered in fondant, the designed was made for a stencil and sprayed gold. If I could give one piece of advice to brides it would be to definitely think outside of the box and have fun!